I enjoyed reading the Official Guide to the CSSLP. I read it cover to cover and with the practice questions and the CSSLP practice questions I feel adequately prepared for the CSSLP exam I am taking in a few months. I liked the fact that Michael Howard wrote the foreword. He is considered one of the pioneers in the application security space. I have read many of his books and blog posts cover to cover. A few of my peers in the industry wrote essays to get their CSSLP. I have my CISSP after taking the exam and having the necessary work experience. I enjoyed the layout of The Official Guide to the CSSLP book because it covers all of the domains for the CSSLP. I really enjoyed the real life examples in the book. You can tell that the author has a lot of real world experience and did a lot of research to write this book. I noticed on Amazon the author wrote an updated version of the Official Guide to the CSSLP. I may purchase that one as well. It was 20 dollars more than the one I have. This book provides the foundation for a solid application security engineer by covering the topics of; secure software, secure software requirements, secure software design, secure implementation, coding, secure software testing, software acceptance and finally software deployment, operations and disposal. The final chapter was most beneficial to me because I have the least experience in it. I enjoyed secure software testing but much of it was content I was already aware of being an ethical application penetration tester. I like that ISC2 is creating this certification as it validates the experience and credentials of application security engineers like me. I really, really enjoyed the diagrams in the book. They were easy to read and allowed me to visually look at the content. The core concepts of confidentiality, integrity and availability are drilled in this book. My only complaint that there appears to be some duplicate content with stressing the confidentiality, integrity and availability of software systems. The reference to all of the standards including, industry, government, international and national standards was beneficial. 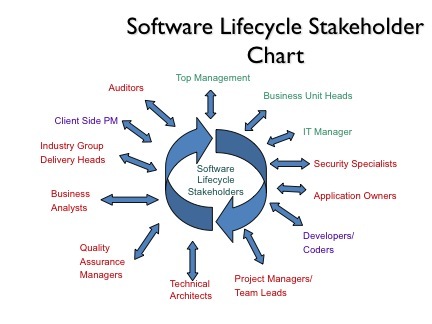 You find that many of the standards have similar goals of keeping with the confidentiality, integrity and availability of software applications. The only issue I have with these is that I am having a hard time remember some of the different NIST certifications, as they are only a small difference in numbering. I hope that with flash cards that I create from the content of the book I can adequately remember the content and be able to pass the exam. I was thrilled that Open Web Application Security Project was mentioned multiple times in the book. I have been a long time member and have read many of the documents created by OWASP. I am also a board member of OWASP Dallas and enjoy the mission and vision of OWASP making applications more secure around the world. I really enjoyed the review questions in this book. I imagine the new book has more updated review questions. I may have to buy that book just to get the new questions for the exam. 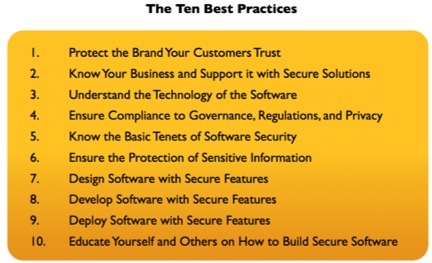 The author has lot of expertise in software security and put a lot of hard work into the book. Java has many built in security features that developers of your organization need to use. It is best not to build your own cryptography methods but use well established classes that have been tested and verified. · Support for a wide range of standard algorithms including RSA, DSA, AES, Triple DES, SHA, PKCS#5, RC2, and RC4. · A comprehensive policy and permissions API that allows the developer to create and administer applications requiring fine-grained access to security-sensitive resources. APIs and implementations for the following standards-based secure communications protocols: Transport Layer Security (TLS), Secure Sockets Layer (SSL), Kerberos (accessible through GSS-API), and the Simple Authentication and Security Layer (SASL). Full support for HTTPS over SSL/TLS is also included. For the .NET portion of the article most of the security vulnerabilities come from insecure configuration management in the web.config file. The below setting is insecure. It is a good idea to have a custom error page that states there was a problem please try again and have the user use the back button on the users browser. In Internet Explorer 6.0, Microsoft introduced a new cookie property called HttpOnly. While you can set the property programmatically, you can set it generically in the site configuration. When you disable custom errors as shown below, ASP.NET provides a detailed error message to clients by default. Having the detailed error message to the user or attacker could give an attacker information leakage about the system to launch an attack on the application. Displaying the type of language the application is written in, the database type, the web server operating system gives too much information to a would be attacker to compromise the application. Hardcoded credentials to a production database are really the keys to sensitive intellectual property or customer data. Anyone that has access to hard coded credentials has access to the database. So hopefully you have a better understanding of java and .NET security. A few configuration issues fixed in the web.config can make your application secure and better protect it from hackers. So you want to be a CSSLP. Why is it important to become one and what will you learn? Who are the stake holders in the organization? CSSLP the beginning: What is secure software development? So lets talk about what we are trying to accomplish becoming a CSSLP. 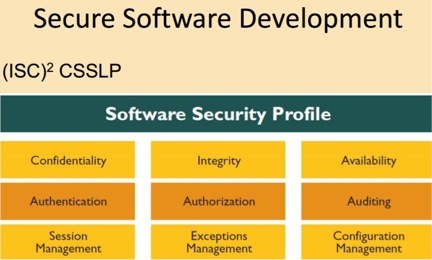 In order to be a CSSLP you need to understand the basic concepts of software security. Confidentiality– keeping data private that is sensitive. Authentication– verifying the entity that they are who they say they are. Session management– HTTP is a stateless protocol and this is usually managed by cookies. States or session are sensitive. Authorization- the entity has the clearance to do what he or she is supposed to do no more or no less. This also ties with the principle of least privilege. Exceptions management– that the software systems handles errors properly and maintains a fail safe secure state. Availability– that the software system is up and running when it needs to, to support the business. Auditing– the who, what, where and when questions to an activity. Configuration management– making sure that that vulnerabilities are not introduced to software systems when making changes. 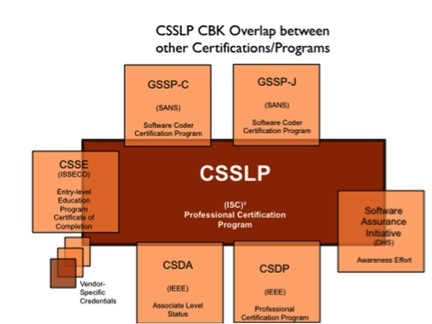 I am studying to become a CSSLP. I have had my CISSP for a number of years and have been a programmer and ethical hacker for ten years. I have my master’s degree in information security and management science and a bachelor’s degree in information science and human computer interaction. I work for a very large security company. I am taking the exam too and wanted to share my knowledge of studying for it with the blogsphere.